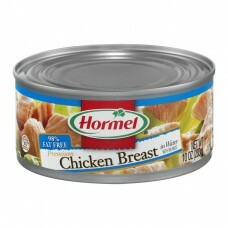 Hormel® Premium Chicken Breast In water with rib meat. 98% fat free. Inspected for wholesomeness by U.S. Department of Agriculture. ©Hormel Foods, LLC. No preservatives. No MSG added. 1-800-523-4635. Visit www.hormel.com.